From north to south, these are the places for beach camping in San Diego county. If you are looking for Southern California beach camping, San Onofre State Beach is a scenic spot just south of Orange county in north San Diego county. There are 3.5 miles of sandy beaches, great surfing and two San Diego beach campgrounds here, with a total of 308 campsites. San Onofre Bluffs Campground has sites for tent and RV camping right along the beach bluffs near the Pacific Coast Highway 101, with short trails to the beautiful sandy beach. There are fire pits and picnic tables in the camp sites but no hookups. San Onofre San Mateo Campground is 1.5 miles inland from the beach, connected by a scenic path. This campground includes both tent and RV camping, hot indoor showers, firepits, picnic tables and hookups. My dad was in the military, and I remember camping at many places as a child, but never did we get to go camping at San Diego Beaches like Camp Pendleton. Some rate these as the best beach camping in San Diego, California, so if you qualify (active duty or retired military personnel or dependents), take advantage of these excellent beaches and campgrounds on Camp Pendleton Marine Corps Reserve. San Onofre Beach, not to be confused with the public one, has tent and RV campsites and group camping exclusively for military personnel. Located at the north end of Camp Pendleton, between the popular Trestles and San Onofre Surfing beaches. About 15 miles south on Camp Pendleton is Del Mar Beach, which also has tent and RV campsites and group camping. Camp Pendleton’s Del Mar beach has a very nice, deep sandy beach, excellent surf spot next to Oceanside’s North Jetty, and a small marina. This beach can handle large crowds in the summer, which it gets on weekends. This is a lovely San Diego beach camping spot if you are military. These military campgrounds have great beaches and views, especially if you can get a campsite right next to the beach. 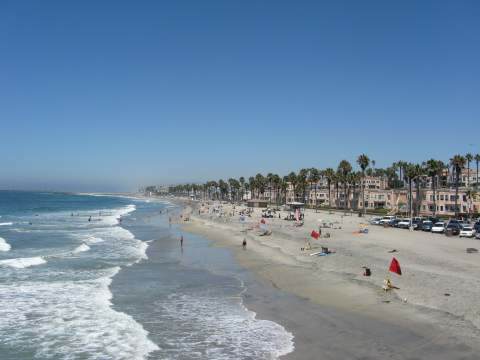 Harbor Beach is a beautiful beach in Oceanside California, near the Oceanside Beach and marina. Harbor Beach Campground is a first come, first serve inexpensive place for RV or trailer camping or overnight parking, if you are lucky enough to get a spot. This is a small parking lot with spaces and fire rings, nearby restrooms, but no hookups. There is a lot to do in Oceanside, with its 3 miles of beaches and nearby California Surf Museum, and proximity to Carlsbad attractions. If you want luxurious San Diego beach camping, this is not your spot, but the price is right and the Oceanside beaches are lovely. Driving Directions to Harbor Beach Campground, Oceanside: From Interstate 5 in Oceanside, CA, exit 54C Oceanside Harbor Dr. Go west on S. Harbor Drive, then right on N. Pacific Street. 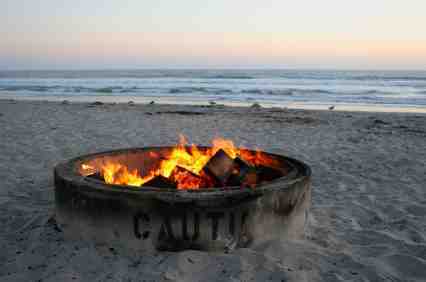 If you are looking for a quiet spot for beach camping in San Diego CA, South Carlsbad State Beach is your place. Popular with families who want to get away from it all, this is a quiet spot located on the bluffs, with stairs down to access the beach for swimming and surfing. This California State Beach campground has 222 tent and RV campsites with full hookups on the bluff, restrooms and showers, and a camp store, but not much else nearby as it is mostly surrounded by residential neighborhoods and the Pacific Ocean. No day use allowed, so all of this makes this spot a little quieter than San Elijo State Beach Campground just a few miles to the south. Reservations are a must in the summer, and this popular campground sells out early! Nearby are some of the popular attractions in Carlsbad, including Legoland California, Sealife Aquarium, Carlsbad Flower Fields, and the Carlsbad Lagoon. Reservations are a must during the summer and weekends. This popular San Diego beach camping spot sells out 7 months in advance, when reservations open up on the 1st day of each month. Make reservations through ReserveAmerica 800 444-7275 (from 7 months to 48 hours in advance). First come first serve during last 48 hours, and if you are lucky you might find an open spot. Address: 7201 Carlsbad Blvd., Carlsbad, CA 92008 (Carlsbad Blvd. is Highway 101 in this section). Driving Directions to South Carlsbad State Beach Campground: This way is recommended for RVs in particular, as the other route requires a U-turn). From Interstate 5 in Carlsbad Calif, exit Palomar Airport Blvd. Go west toward the beach, then south on Carlsbad Blvd. (Hwy 101) for about 2 miles until you reach the state beach campground entrance on the right. Directions to Carlsbad California State Beach by Train - You can easily reach this beach campground from the San Diego Coaster Train. 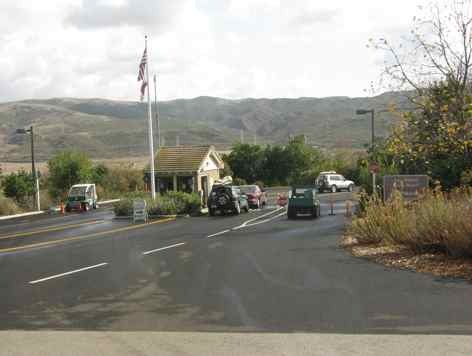 It is located 1/2 mile south of the Poinsettia train station. San Elijo State Beach is my favorite of the San Diego Beach campgrounds, located on the Pacific Coast Highway 101 on the bluffs just south of Swami’s surf spot. This is one of the most desirable spots for beach camping in Southern California. You can walk or bike ride to the charming strip on historic 101 of old Encinitas, with many restaurants and shops. This California State Beach campground has 171` tent and RV campsites with full hookups on the bluff, restrooms and showers, wi-fi service, a camp store and a yummy taco stand. The beach is accessed by steep sets of stairs and is popular with surfers, swimmers, and walkers, as day use is also permitted. 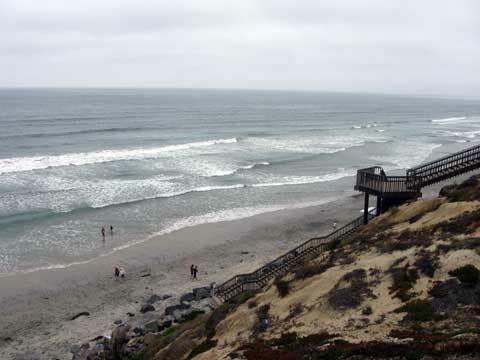 Reservations are a must in the summer, and this popular spot for San Diego beach camping sells out early! Nearby must see sites include the Self Realization Temple and San Diego Botanic Garden . Reserve your spot early! This popular San Diego beach camping spot sells out 7 months in advance, when reservations open up on the 1st day of each month. Make reservations through Reserve America 800 444-7275 (from 7 months to 48 hours in advance). First come first serve during the last 48 hours, and if you are lucky you might find an open camping site due to a late cancellation. Driving Directions to San Elijo State Beach Campground: From Interstate 5, take the Encinitas Blvd. exit and go west to the last stoplight. Turn left onto Hwy 101, travel about 2 miles through the charming town of Encinitas, past the Self Realization Fellowship Temple, past Swamis surfing spot until you reach the San Elijo State Beach Campgrounds on your right. Directions to San Elijo State Beach by Train - You can easily reach this beach campground from the San Diego Coaster Train. It is located 2 mile south of the Encinitas train station. Taxi cabs are usually available. Campland on the Bay is a private campground in San Diego’s Mission Bay Park, on the northern shores of Mission Bay. If you love water sports this is the place to be. You can rent anything from sailboats, motorboats, pedal boats, water skis, canoes, jet skis and kayaks, or bring your own boat to launch. This is in the heart of San Diego, so you are close to Mission Beach, Sea World San Diego, San Diego Zoo, San Diego Balboa Park and much more. Reservations recommended. Driving Directions to Campland on the Bay: From Interstate 5 in downtown San Diego, CA, exit 23A toward Grand Ave/Garnet Ave. Merge onto Mission Bay Dr., turn right at Grand Ave, left at Olney St., then left at Pacific Beach Dr. Camp land on the Bay will be on the right. 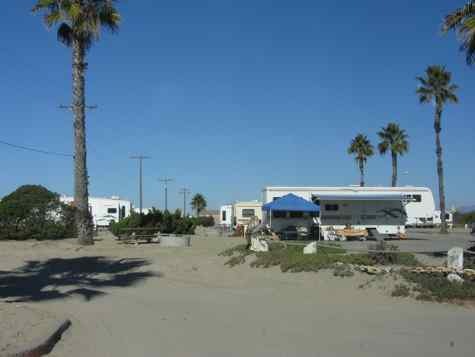 Silver Strand State Beach is a popular RV beach campground on Coronado, not far from the world famous Coronado Beach and its adjacent Coronado dog beach. There is a nice bike path along this area, with plenty of beaches to explore and views to experience. This location for San Diego beach camping is beautiful – a nice sandy Pacific Ocean beach right in front of you, and the San Diego Bay right behind you. 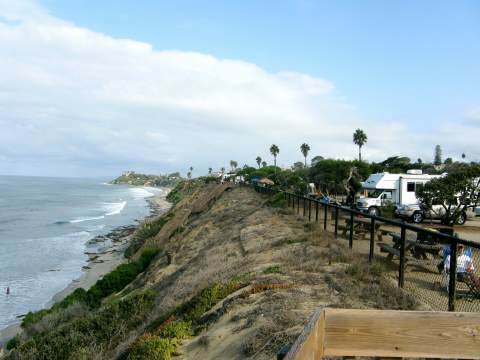 While this is one of the loveliest San Diego beach camp grounds in terms of location, it is limited to self-contained vehicles, motor homes, or trailers. There are no hookup facilities. Driving Directions to San Elijo State Beach Campground: From Interstate 5, take the beautiful Coronado Bay Bridge from downtown San Diego to Coronado. Follow Hwy 75 southward until you reach Silver Strand State Beach. 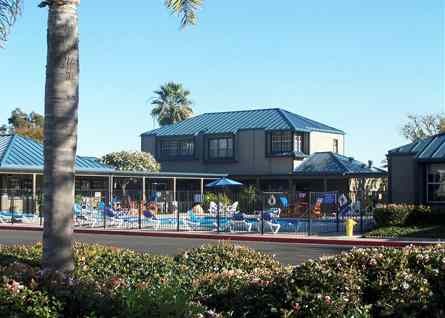 Just across the San Diego Bay from Silver Strand State Beach is Chula Vista RV Resort and Marina, a premier RV resort with 237 RV sites and full hookups. The sites are landscaped with trees and shrubs. The resort contains a private swimming pool, jacuzzi spa, store and two restaurants. Nearby are landscaped parks and its own 552 slip marina. Close to everything in San Diego, this is perfect for boat lovers. You are also close to San Diego Balboa Park , Seaport Village, San Diego Zoo, Coronado and much more. Reservations recommended. Driving Directions to Chula Vista RV Resort : From Interstate 5 in downtown San Diego, CA, exit at J Street/Marina Pkwy and head west, follow Marina Pkwy to the stop sign at Sandpiper Way and turn left then continue on Sandpiper Way around the bend, entrance to Chula Vista RV Resort will be on your left.